Football. It’s a strange thing really, isn’t it? 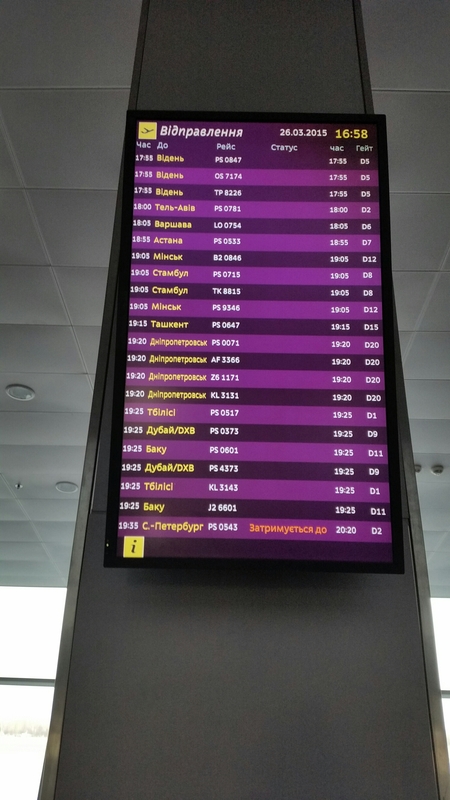 I certainly never expected to be sat in Kiev airport for six hours on a Thursday afternoon, patiently waiting for a connection to Tel Aviv but yet, here I was. Despite being as European as a kangaroo, Israel play under the jurisdiction of UEFA. It seems very strange, but is made much more understandable when you consider the alternative option of Israel having to take on their neighbours instead. Perhaps even more surprising than visiting the Middle East for a European qualifier was the fact that Wales had managed to make it through the first four group matches without being eliminated. My lifetime spent watching Wales has been divided between being completely terrible and being just good enough to get our hopes up, before crushing these dreams in the most painful way possible. But with this team, things might just be different. After answering more questions than a first date with Jeremy Paxman I was finally allowed in to the country, where the second adventure of the night was waiting. After offering to show my taxi driver the hotel address he insisted he didn’t need it and knew where he was going. The car stopped outside a building that was very clearly not a hotel, but his insistence of “Is here! No problem no problem!” encouraged me to walk in. As I suspected, it was not a hotel, but indeed, a house where people lived, including a surprised looking lady who was watching TV before I strolled in to her living room. Thankfully she spoke English and didn’t call the police, instead showing me the actual way to the hotel – a 35 minute walk! Despite this opening night drama, the rest of the trip did not feel dangerous at all, and almost every Israeli we met was happy to see us and extremely welcoming. Despite the friendliness, there was the occasional reminded of how life is different here. 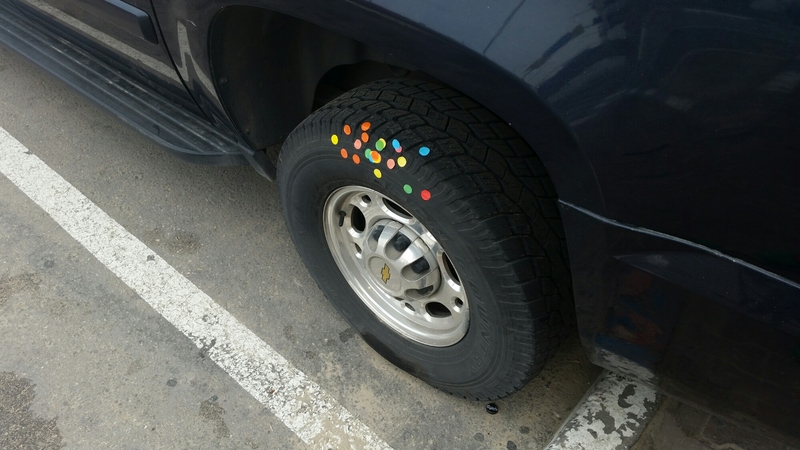 I asked a local about the colourful stickers on the wheels of the cars outside the bar we were in. His casual answer was that these stickers indicated that the army had been checking underneath them for bombs. Ah. Shouldn’t have asked. 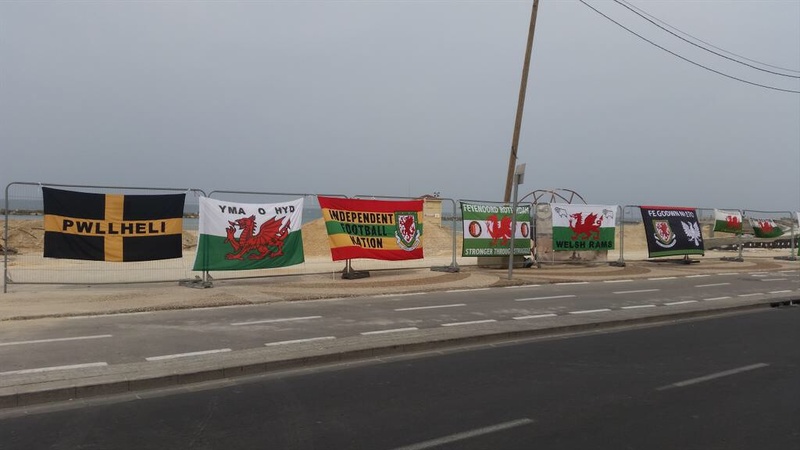 Another reminder of the tense state of the country came in Haifa on the day of the game, where on the same street as hundreds of Wales fans stood singing songs, dancing and drinking, every driver of Arabic appearance was being pulled over and searched by the police. It seemed as though this was just a routine part of life here, but it was clearly concerning to many of the away supporters who observed what was going on. 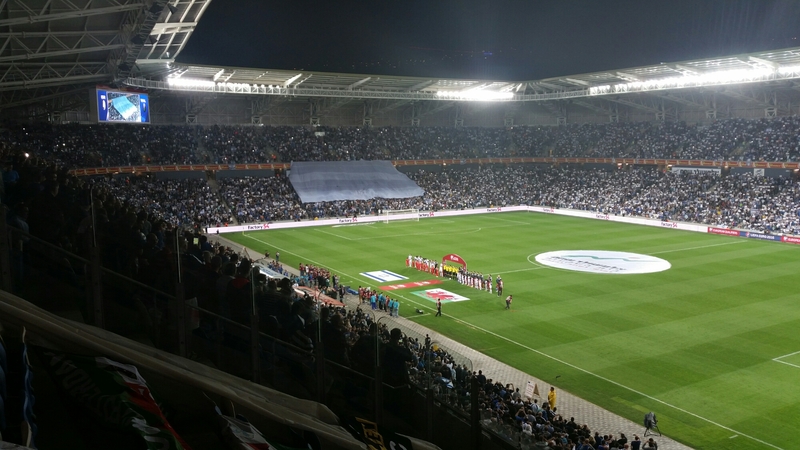 Any tension about the political state of Israel was totally outweighed by the tension surrounding the match. It was the biggest game for Wales since 2003, and one of the most significant in our football history. For Israel too, the fans were buzzing with anticipation for what was their biggest game for decades. The stadium was sold out, and the home crowd was doing everything it could to give them the upper hand. The Welsh team was loudly whistled when they appeared on the pitch, with every name that was read out being booed – with a special venom for a certain Gareth Bale. After a rousing rendition of the Welsh anthem (since moving abroad, I always seem to get dust in my eye when I hear it) which was respected by the home fans, a singer took to the field to lead the home fans in a haunting version of their anthem. I’ve been to quite a few places to watch Wales, and never heard an opposition anthem sung like this. It felt like it was going to be a long and difficult night. 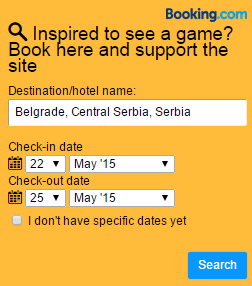 Which just goes to show that really, I don’t know anything about football at all. From the very start, Wales were magnificent. My friend Ralph commented to me “God, we’ve been brilliant so far!”. I checked the clock and the game was 56 seconds old. Still, if you couldn’t get carried away on a night like this, you probably never will. Gareth Bale was flying down the wings and tormenting the opposition defenders, while the passing of Allen and Ramsey was more than they could cope with. The Israel fans kept up the noisy chanting and jeering of the Wales players, encouraged by the stadium announcer, but it was not having an impact on the pitch. Meanwhile, the Wales end was getting louder and louder. 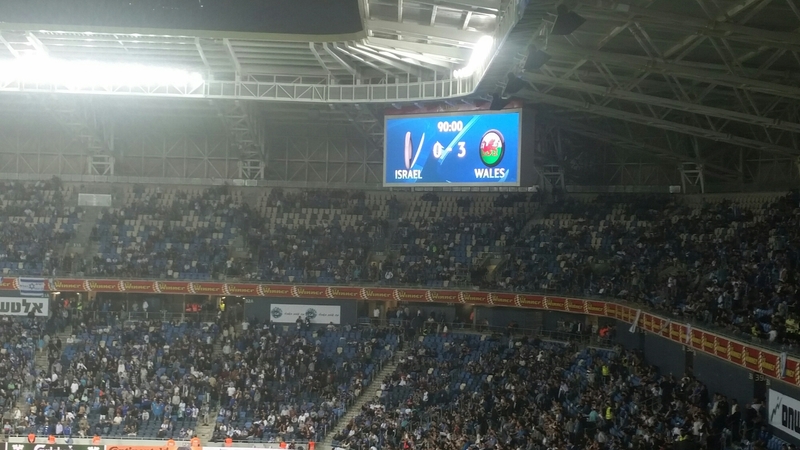 The seemingly unlikely chance of a win was becoming more and more likely by the minute, and the full range of Welsh songs were being given an airing in the evening heat of Haifa. In particular, “independent football nation” was sung over and over again, making it clear that no Team GB was welcome. Surely Scottish, English and Northern Irish fans don’t want this either, so why is it even being considered? Wales could have taken the lead on several occasions in the first half, with the best chance falling to James Collins. Unfortunately this is the worst possible Welshman to rely on in this scenario, and he contrived to miss the goal when even Tom Jones would have finished it. Israel had just one shot in the first half, flashing narrowly wide. Just one minute of additional time, and a strong 45 minutes to reflect on even if we hadn’t managed to find the net…oh hang on a minute, we’ve scored! The Welsh end erupts into delirium, as Aaron Ramsey manages to send a looping header over the goalkeeper from a tricky angle. The next minute or so is a blur, as I went from standing next to my friends to standing in the stairwell hugging a man from Wrexham and performing a lewd act on an imaginary sheep, as we reminded the home side that it was indeed, 1-0 to the sheep shaggers. After the joy of the goal came the disbelief. We were actually winning. Hang on for another 45 minutes, and we would storm to the top of the group, becoming big favourites to qualify along with Belgium, who will surely recover from their ropey start to take 1st place. The general consensus at half time was that Israel could not be that bad again, and we would probably need at least one more goal if we wanted to take all three points with us back to Europe. Gareth Bale had other plans for how the game would go. Inexplicably hated by an idiotic contingent of Real Madrid fans, he was playing like a man possessed. Five minutes in to the second half he was fouled by an Israeli defender. Not given the chance to take free kicks at domestic level at the insistence of a certain C. Ronaldo, he was not going to be denied here. He stepped up, took a deep breath, and sent 1000 Welsh fans in the far corner of the stadium into dreamland. His perfectly placed effort left the keeper no chance, and also left the away end with little chance do staying in their original row, people flying all over the place as they raced to celebrate with whoever they could find. I celebrated this second goal so much my voice was instantly gone. Even today, I cannot communicate in any other form than pointing and a series of squeaks. 2-0 is a dangerous lead according to a range of generic Sky Sports pundits, but nobody told Wales. Just a minute later, the same defender who had fouled Bale earlier did so again, earning a second yellow card and the first pick of the post match falafel. Israel’s vociferous home crowd had been stunned into silence, while the away crowd had been stunned into mayhem. The second goal and red card was followed by a five minute period where Israel didn’t touch the ball once, every Wales pass greeted with an ‘Ole!’ Real Madrid were also reminded of our star players brilliance, with chants of “Are you watching Real Madrid?” and another of “Gareth Bale’s a Welshman, but now he plays in Spain, and whenever Wales play, he’s the first one on the plane, he scores our goals, he runs all day, he’s super f****** quick, his best mate is Aaron Ramsey, because Ronaldo is a prick!” getting an airing. I personally met fans of Wrexham, Swansea, Cardiff, Everton, Llandudno, Clapton, Newport, Derby County, Doncaster Rovers and Sutton United, a gloriously unusual mix who had all come together as one and celebrate a magnificent night for Welsh football. Earlier in the game, the stadium announcer had been screaming the first half of a chant, with the rest of the ground then joining it. He tried to do it again at 2-0, with his screams met with a deafening silence. Not a single home fan joined in, many of them heading to the exits. It was the best possible demonstration of how perfect the Welsh performance had been. We had come in to one of the most difficult and challenging environments possible in the qualifiers and not just survived, but thrived. As more and more Israel fans headed home early, the Welsh party (and not to mention disbelief) went into overdrive with the arrival of goal number three. The celebrations for this goal were not so much carnage but amusement. This just didn’t happen to Wales. Jesus Christ, could this really be happening to Wales? I was still a bit concerned in the 85th minute that we’d find a way to lose 4-3, but that belongs to a previous era of Welsh football. Things are changing for the better, and an outing to France for our first tournament since 1958 seems not just possible, but likely. As the Welsh players huddled together in celebration at the end of the game before coming over to salute the away supporters, the sense of togetherness was stronger than it has ever been. The party didn’t stop inside the stadium, the bars of Tel Aviv full of Welsh fans all night long. I went to bed around 5am, and suspect I was probably one of the first. A special mention must go to the incredibly drunk Wales fan who asked a local taxi driver to take him home to Merthyr Tydfil. He became very indignant that the driver wouldn’t take him home, until his mate reminded him they were in Israel instead of Wales, and Merthyr was about three days nonstop drive away. The madness of the conversation reflected the unbelievable nature of the night. Belgium, qualification was still a dream, with plenty of hard work ahead. After Israel, the dream is real. Posted on March 29, 2015, in General. Bookmark the permalink. 2 Comments.